We’d love your help. 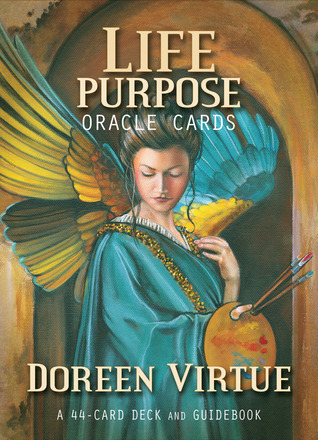 Let us know what’s wrong with this preview of Life Purpose Oracle Cards by Doreen Virtue. Before you were born, you worked with your angels to orchestrate a life mission that would help others and be emotionally rewarding. This card deck by Doreen Virtue will allow you to conduct accurate and trustworthy readings to explore that life purpose. Each of the 44 beautifully illustrated cards contains an illuminating message from the angels related to this topic. The Before you were born, you worked with your angels to orchestrate a life mission that would help others and be emotionally rewarding. This card deck by Doreen Virtue will allow you to conduct accurate and trustworthy readings to explore that life purpose. Each of the 44 beautifully illustrated cards contains an illuminating message from the angels related to this topic. The accompanying guidebook explains the general meanings of the cards and provides specific details that can offer more clarity about your career and spiritual path. Whether you’re seeking answers for yourself or your loved ones and clients, these cards can yield valuable insights. The angels are happy to guide every aspect of your life purpose! To ask other readers questions about Life Purpose Oracle Cards, please sign up. Lindo, conselhos incríveis... só me incomoda que tudo é anjo no meio rs. Massssssss tá lindinho, serve muito bem, e adoro as mensagens como cabem para cada situação. The focus of this card deck is to help us find our life purpose. The oracle cards address a variety of factors related with "life purpose" including: clarity on career path (I believe its best when used to accompany other decks), the careers we would be happy in, spiritual path, emotional guidance with our career path, creativity, manifestation, guidance etc. * Pretty artwork featuring soo The focus of this card deck is to help us find our life purpose. The oracle cards address a variety of factors related with "life purpose" including: clarity on career path (I believe its best when used to accompany other decks), the careers we would be happy in, spiritual path, emotional guidance with our career path, creativity, manifestation, guidance etc. The booklet in this one is very straight forward (there are no alternate meanings) which I greatly appreciate. Very, very clear answers! Love! You trust these easier when you have good gut feelings instead of doubts :-). My favorite until now.